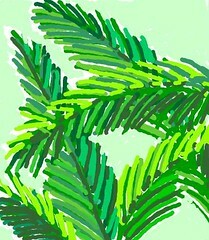 This is the sketch I started in San Diego last week on my handheld computer, using Pocket Artist. I have been very busy since I got back from my trip, just running to catch up! But tonight I took a break to work on this sketch. I opened it in Painter IX to start cleaning it up with digital chalk. I want to correct some of the problems but keep the spontaneity of the original. I am using Painter IX to finish this because in the handheld paint program, the image is small, and the stylus doesn't work well close to the edges of the image. In Painter IX I can enlarge the image, so even though I am using a mouse instead of a stylus, it is still easier to manage. But in both situations, diagonal lines are extremely hard to draw, so tonight I was asking myself WHY I chose to sketch something with nothing but diagonal lines! But the palm trees are so beautiful in San Diego! This is still a work in progress. To be continued. . . .
Today I went up to Manchester, New Hampshire where my paintings and drawings of mountains have been on display since mid-January. This was my first chance to see how the art looked hung on the wall. This is a photo that I took with my phone cam of part of the show. These little drawings were once an acrylic painting, but I cut it up and made nine small landscapes with conte crayon. 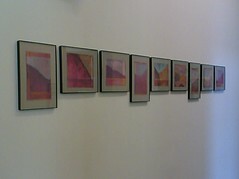 I call them transformational drawings, and for this show I had them hung in a row, as they appear in this photo. 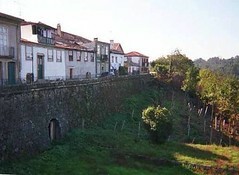 This is a photograph that I took several years ago, during my very first trip to Portugal. I used this photograph as the basis for one of the watercolors that I painted after the trip. In fact, that little painting is being used to publicize my watercolors of Portugal which are being shown this month in Salem. I hung the art show today, which is why I have been thinking about this image. Tonight I cropped the original photograph and adjusted the contrast just a bit, and here it is. 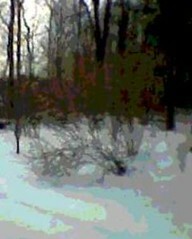 This image began as a picture taken on February 14th with my phonecam. 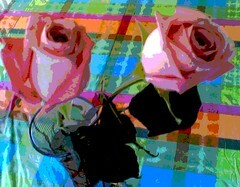 I went to the grocery store on an errand and there were roses everywhere, so I took a photo. 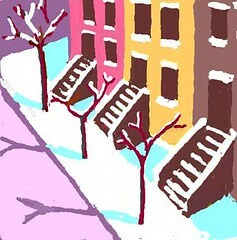 Later I cropped the image and posterized it in Painter IX. But I didn't like the background in the lower left corner; it was plain white, and seemed distracting. So tonight I opened the image in Painter IX and drew into the area with digital pastel, then posterized that corner again. Well, that is a lot of trouble for grocery store roses. But it is good to remember that roses are everywhere, if we just stop to look for them, and they are definitely worth our time and attention! We went to Mardi Gras in San Diego. 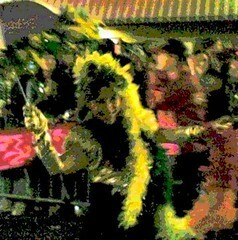 We were hoping for more music, maybe some samba to really get the feeling of Carnival in Brazil, but it was fun anyway. This image began as a photo taken with my cameraphone during the parade. 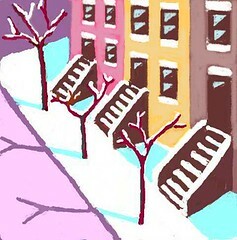 Today I cropped the image and fiddled with the contrast, then opened it in Painter IX. I used digital pastel to get rid of some advertising signs that I didn't want, then posterized the image. Now I have another souvenir, along with all those Mardi Gras beads. I just got home from a short trip (three days) in San Diego, where I visited friends from Brazil who are spending a few months in California. In many ways, I felt like I was in Brazil, speaking Portuguese and eating Brazilian food. It was easy to feel that way with tropical San Diego as a backdrop. When I arrived from the ice and snow of Boston, I saw palm trees everywhere. 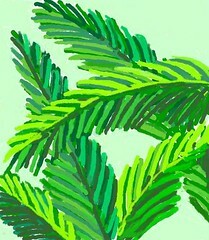 One morning, I decided to sketch some of the palm trees in the courtyard, using my PDA Pocket Artist. This is how the sketch looked after an hour. This is a work in progress. To be continued. . . Although I did go for a walk today, it was not at Long Hill Gardens. (It is far too icy; walking on the slick sidewalks close to home is more than enough of an adventure for me.) 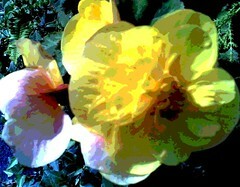 This picture began as a photo taken at Long Hill last year with my phonecam. Today I posterized the photo in Painter IX and then cropped this image out of the photograph. 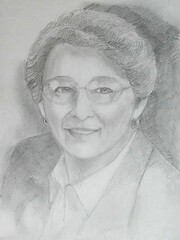 In December, I finished painting a portrait for my friends. This is the preliminary sketch I did last spring, to prepare to paint the portrait (Sometimes I do that to study the face I am going to paint.) Anyway, even though the portrait is finished, I like this little sketch for its own sake, and decided to finish it up and send it to my friends. I don't want to make a lot of changes, but I widened the face a bit, and added some detail to the eyes and mouth. I also started putting in some background. This is how it looks today. To be continued. . . . 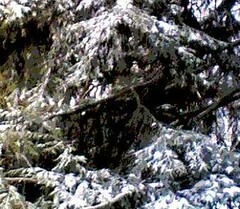 This morning I took a photo of the morning light on new snow. 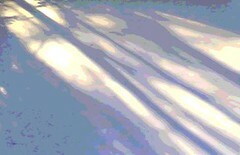 Later I cropped the image and then posterized it using Painter IX, and here it is. It was snowing this morning so I took some pictures. Tonight I cropped this image and posterized it using Painter IX. Today I went back to Red Brick to work on this collage. 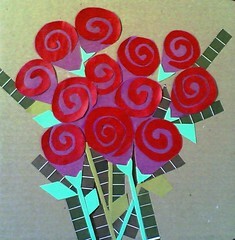 I added more of the striped strips to add contrast against the stems. I used a little bit of marker where the fit was not perfect. By the time I used up all of the brown and green strips, it was time to pack up and go home. I had brought along some additional collage materials for this project, but I couldn't decide what I wanted to do with them. Even though I had hoped to finish this today, I decided not to rush because I need time to think about what I want to add to this collage. So this is still a work in progress. To be continued. . . .
Today I went to my studio at Red Brick Art Center, and worked on this collage for a while. I began by adding leaves and stems to the roses, working with paper I had at hand: some pantone paper, and the cover from an old watercolor block. I decided that I needed some darker green for contrast, so I cut some strips from the edges of the pantone paper (samples showing how the color will print with black) and put the pieces down to see how they would look. 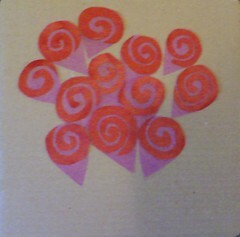 I decided that I like the geometric effect of these little strips, so I will add more next time. This is how the collage looked when it was time to pack up and go home. To be continued. . . . 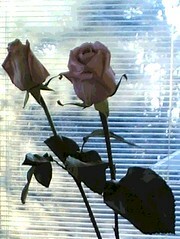 These are the same two roses, photographed from above. I posterized this photo as well, but in this case, inspired by the bright colors of the tablecloth, I chose a more pronounced level for the posterizing effect. Today I tried posterizing the image with Painter IX, using a very light touch. Here is the posterized version, for comparison. At the moment, I have two roses on my table, and I love to look at them. Today I noticed how they looked against the light coming through the window. I took some photos with my cameraphone. I cropped this image out of one of them, and was thinking about posterizing it. But then I decided that I like it as it is. After our recent ice-storm, I tried to take pictures of the ice on the hedge. (It was challenging to get close enough for a good photo without breaking my neck on the ice!) But I liked the way the sun looked as it hit the ice-covered branches, so I took pictures with my phonecam. 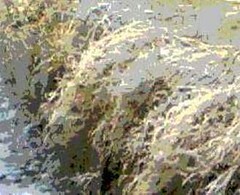 Today I cropped this image out of one of the photos. I opened it in Painter IX because I thought it might look nice posterized. This image is the result. 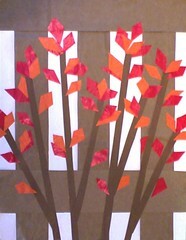 Last week at Red Brick, I finally finished my collage of bright fall leaves. I also went there with an idea for a new one, a bouquet of red roses, but I only had a brief time left to get it started. 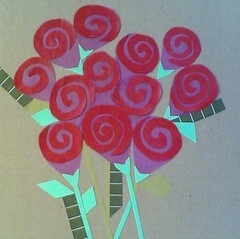 I had some red and pink paper that my daughter had saved for me, and I decided to make big stylized spirals for the roses. I spent time figuring out how to cut them to get the look I wanted, and then just had time to paste a few down on cardboard. Today I returned to Red Brick and worked some more on this collage. 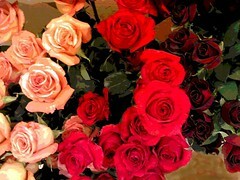 By the time I had a dozen roses pasted down, it was time to pack up and go home. Besides, I couldn't find any green paper for the leaves. To be continued. . .
Today I worked on this image again, using the Painter IX program on my computer. I wanted to correct some things that were bothering me. The shadow of the third tree didn't extend into the street, so I fixed that. I also reworked the third staircase, and adjusted the perspective. In addition, I did a little bit of cleaning up, straightening lines and removed stray marks. I don't want this little digital drawing to look over-worked, so I think will stop working on it, at least for a while. I am not completely sure this drawing is finished, but I am satisfied with it as it looks now. 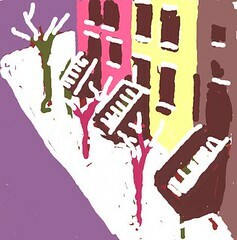 This image began as a sketch of New York City that I made with my PDA, as I rode the train from New York to Boston. This week I have continued to work on it using my handheld computer, but tonight I opened it up in Painter IX on my full-size computer (with its full-size screen). Besides cleaning up the image and straightening some of the lines, I softened the colors of the buildings and added suggestions of windows. There are still a few things left to fix, so I will say this is to be continued. . . .
Today I worked on this drawing using my handheld computer. I changed the color of the trees back to red, and then worked on cleaning the image up. This is helping me to get used to working with this new program (Pocket Artist), but I probably have gone as far as I can with the handheld. The next step will be to open it in Painter IX on the computer and finish it that way. Today I did some more work on this drawing, using my PDA (Pocket Painter program). I changed some of the colors and straightened out some of the lines. This is still a work in progress. To be continued. . . It snowed while I was in New York City, and this little digital sketch was inspired by a walk down Manhattan's snowy side streets. I started it on the train back to Boston, using the Pocket Artist program on my PDA. Today I worked on it some more, still using the PDA. It is still very much a work in progress, but the general idea is starting to appear. To be continued. . .
Today I went over to Red Brick to begin a new collage. But first I finished this one, started in the fall. I added one or two leaves at the top of the image, and several more in the lower part to balance the composition. Now I consider this collage finished, apart from coating it with clear acrylic medium to protect it. I took a couple of photographs of it, but I took this one in indirect sunlight and I like the effect of sunlight on the paper leaves.